SPANISH CAVA SPARKLING WINE "SPANISH CHAMPAGNE"
The Spanish make oodles of sparkling wine and those of particular interest are fermented in bottle, along the lines of French Champagnes. Most Spanish sparklers will have, somewhere on the label, the term "Cava." This is a fairly recent designation and it first came to light in 1959. In 1969 the Spanish government required wines called Cava to be bottle fermented. This was more formally decreed in 1972 when an entire bureaucracy was created to regulate these products. Over the years, the rules and regs have become more formalized and slightly easier for consumers to determine, at least, some helpful information on the labels. For example, if we recall correctly, one could not say for certain if a bottle of Spanish bubbly was made using the traditional method of bottle fermentation or if it had been made by the Charmat, bulk process. This may have been revealed only when you removed the cork from the bottle and there was some sort of notation of "stars" on the cork letting you know your wine was, in fact, bottle fermented. Today, you can determine that by looking at the label. Spanish sparklers with the Cava designation must be made from Macabeo (Viura), Xarel.lo, Parellada, Malvas�a (it's sometimes called "Subirat Parent" by the kids in Catalonia) and Chardonnay for the white varieties. For the red grapes, you might find Garnacha tinta, Monastrell, Pinot Noir and Trepat. This latter grape is used to make pink or Cava Rosado wines. We actually have a really good one in the shop. Even though Cava may incorporate red grapes, typically the wines rely upon Macabeo (also known as Viura), Xarel.lo and/or Parellada. Now, some producers are planting Chardonnay and Pinot Noir in an attempt to make their wines more of a copy of Champagne...good luck with that. Spain doesn't have the same terroir or quite the same climate! And isn't it a pity to change a wine that has been unique and particular to Spain to make a copy of someone else's wine? Cava producers actually have some analytical requirements to conform to. These cover the amount of alcohol, acidity and such in the base wine. Then there are some aging requirements. Cava, at the very least, must spend 9 months in the bottle. If it's a Reserva, it needs 15 months and a Gran Reserva must spend, at least, 30 months in the bottle. On a Gran Reserva Cava, you won't see a wine that's Dulce or Semi Seco. 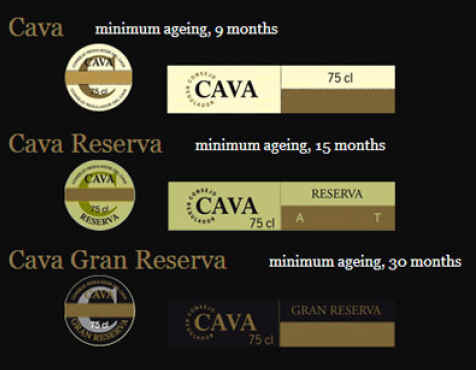 In fact, Gran Reserva must be solely Brut Nature, Extra Brut or Brut. The Spanish prefer the drier versions of Cava as 79% of what they drink are Brut (and drier) bottlings. Meanwhile, the export market tends to purchase minuscule amounts of the very driest Cavas and more than half of what is exported is in the sweeter "Seco" and "Semi Seco" categories. Germany is Spain's most important Cava customer, followed by the United Kingdom. The US is third on the list, buying about 48% of Germany's total and about 60% of Britain's! France has been a good customer, but sales have dwindled to 5.7 million bottles as of the latest figures. The Cavas of Spain may strike some palates as being "Champagne-like." In our experience, sparkling wine is one of the most difficult types of wine to assess. If you drink lots of sparkling wine, you will find your palate can perceive various differences and subtleties. If you're a fairly casual sipper of sparklers, you're less likely to be able to detect the various nuances (if there are any) in certain wines. As a result, many relatively modest quality bubblies (not necessarily Cava) make for perfectly acceptable stand-ins for Champagne. We have good, well-made, really drinkable Cava for small money and, of course, there are some more deluxe bottlings available. The Raventos family has owned property in the Penedes region since a few years after Columbus sailed the ocean blue...and they still cultivate grapes and, these days, make some remarkable wines. In the 1870s, one of the family decided to try his hand at making sparkling wines, hoping to copy, to some degree, the wines of France's Champagne region. And the Raventos family had a say in setting up the rules and regulations for the "Cava" designation in Spain. But having seen and tasted some of the really marginal, low quality bottlings which bear the once-proud "Cava" designation, the Raventos family withdrew its membership in the Cava association. They've drawn up a new designation for their sparkling wine: Conca del Riu Anoia is the appellation. Unlike the rules for Cava, this designates a particular and small region in Spain for sparkling wine production. The rules also call for a minimum price for grapes, nearly 5 times the minimum pricing for Cava grapes. The Conca del Riu Anoia rules allow solely for traditional, indigenous varieties...no Chardonnay or Pinot Noir. The vineyards must be farmed organically and the vines have to be at least ten years of age. The regulations also insist on the sparkling wine spending at least 9 to 18 months on the spent yeast as a minimum, depending upon the designation of the wine. This bottling is 45% Macabeo, 35% Xarel.lo and 20% Parellada. Vine age ranges from 20 to 50 years and the grapes are farmed biodynamically. It's matured for about a year and a half on the spent yeast and the dosage is fairly minimal, so it tastes nice and dry. We liked its elegance and found it to be a good alternative to California bubblies. The Caves Blancher make this particular bottling of Cava. It's a smallish producer that's now run by the third generation of the founding family. The founder of the company, Antonio Capdevila Pujol long ago had the idea that the quality of their wine was determined by the quality of their grapes. Most of the fruit for this wine, then, is actually grown by the Carbo family (the current owners Ramon and Enric Carbo). It's made of traditional indigenous varieties...Macabeo, Xarel.lo and Parellada. The wine spends at least 20 months on the spent yeast and we would not be surprised if the actual time is a bit longer since the wine is mildly toasty and yeasty. The dosage is very low and so the wine has maybe 4 grams of sugar per liter...so it's actually drier than most of our Brut Champagnes. Another nice feature of this wine, apart from it tastes good, is the price. This is a really nice bottle of bubbly and it's inexpensive. This label has been in the shop for well more than a decade. Cristalino. Nice name for a little Spanish sparkling wine. Too bad the brand name brought a lawsuit from the Champagne firm of Louis Roederer. Roederer, you see, makes a range of Champagnes, topped by their extravagantly-priced Roederer "Cristal." So, Roederer went to court and won. That means the familiar little gold label Cristalino, depicted above, will be changing its label so you won't be so easily confused. "...not affiliated with, sponsored by, approved by, endorsed by, or in any way connected to Louis Roederer's Cristal champagne or Louis Roederer..."
Well, that clears up the mystery, doesn't it? The Jaume Serra winery has been making Cava since the 1980s. The wine features the usual grape varieties founds in the Penedes region and the bubbly spends about 18 months on the yeast and it actually retains a lightly toasty note. The wine is dry, unlike the Cava in the black bottle. There's a rather good Ros� version, too. It's Pinot Noir and the unusual Spanish grape called Trepat. Deep red in color, this is berryish and fruity on the nose, yet dry on the palate. Both are bargain-priced at $6.99 with case discounts being offered, too. Beat that! This old-time brand of bubbly traces its history back to the late 1700s. We're not sure what they were producing back then or during the time of Jefferson or Abe Lincoln. In fact, it was only around FDR's era that business really made some progress. But the 1920s saw some bottles of wine being sold, wines made by Se�or Juv� and his wife, Teresa Camps Farr�. In addition to their wines, they produced two sons. The boys came on board into the wine business and ran things through the 1960s and 1970s. There's a stellar "Gran Reserva" bottling. Not that they don't make good wines, but this was really special. We bought a second bottle to share with another group and the wine caused the same reaction: people all wanted to see what the label and bottle were since the wine was so memorable. Now we have it in the shop...last bottles, though, of this vintage, which spent an extended period on the yeast. The Gramona family has been making wine and bubbly in Spain's Penedes region for several generations. 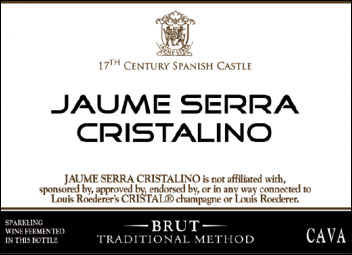 Its bubblies are amongst the most prestigious of Spain and worthy of comparison with Champagnes. The family motto is "Viti, Vini, Vitae" which are three pretty good "v's" to align yourself with. They have three vineyard sites La Plana, Mas Escorp and El Serralet. There they are growing Xarel.lo, Macabeu, Chardonnay and Pinot Noir. Gramona's wines have not been in our market very long, but I noticed them in a distributor's catalogue and bought a bottle to taste. We were most pleasantly surprised, finding the "Imperial" bottling of Cava to be wonderfully yeasty and as dry and elegant as a good French Champagne. Currently in the shop is the 2006 "Imperial," a bottle-fermented bubbly which spends about 30 months on the spent yeast. The base wine is Xarel.lo, Macabeu and Chardonnay. We like elegance and refinement of this wine and while it's not cheap, it is certainly a premium bottle of bubbly. We're fond of the Cava from the Bodegas Pinord, an old Spanish producer with vineyards and wineries in a number of regions. Of course, this comes from the Penedes region. It's a traditional blend of local grape varieties...Macabeo, Parellada and Xarel�lo. No Chardonnay. No Pinot Noir. Each grape is vinified separately and then they make their master blend. The wine spends about two years on the yeast, so it has a nicely "bready" sort of fragrance. The dosage is small, so the wine comes across the palate as quite dry. And then there's the price. It's a mere ten bucks! This is serious bubbly at a not-so-serious price. Currently in stock: DIBON BRUT RESERVE CAVA SALE $9.99.